Oktoberfest is a sixteen day festival held annually in Munich and is a big part of Bavarian culture. This is the largest Beer Festival and Fair which this year runs from 19th September-4th October. People attend from all over the world and other cities also hold Oktoberfest festivities based on Munich celebrations. Oktoberfest began with the Royal Wedding of King Ludwig I to Princess Therese of Saxony-Hildburghausen. To celebrate their marriage there was a great horse race and in 1835 a parade took place. Oktoberfest is full of customs and includes food such as chicken, sausages, red cabbage and pretzels. As well as this traditional folk music is played which becomes louder as the evening wears on and more beer is drunk, then the dancing and singing begins. There are only six breweries allowed to participate in Oktoberfest and each brewery has their own tent. The Mayor of Munich officially opens the celebrations. At Noon he performs the tapping of the first keg of beer then all visitors can drink. A distinctive costume parade also takes place through Munich. If you are not able to get to Munich for this this event there are loads of ways to bring Oktoberfest to you through themed parties and lots of Oktoberfest Decorations as well German Decorations. Having an Oktoberfest Party is the ideal way to celebrate and have friends over for a fun night. Many Pubs, Bars and Restaurants also put on events to enjoy the festivities. We have loads of ideas and products to help you achieve the full Oktoberfest atmosphere. Oktoberfest Banners such as The Gliittered Oktoberfest Banner, the Fringe Banner and Pennant Banner are a good place to start, they make great decorations and let your guests know where the party is as does the Beer Garden Banner and Oktoberfest Garden Sign. An Oktoberfest theme is not only brought together by Oktoberfest Decoration Cutouts which include a typical look of a Jointed Fraulein and Mr Oktoberfest but also Oktoberfest Hats, of which an Oktoberfest Top Hat and a Bavarian Hat are particularly popular. Handing out Oktoberfest Party Pass as your guests arrive is a really cool thing to do (everybody loves to wear a pass around their neck!) 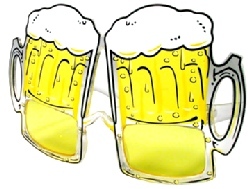 and Beer Sunglasses really capture the essence of Oktoberfest. An Oktoberfest Decorating Kit as well as an Oktoberfest Party Pack are perfect for pubs and bars putting on themed nights and also make shopping and choosing easy.